The Capital of the Gupta Empire: The Gupta Empire was named after the Gupta dynasty which ruled approximately between 320- 550 CE. The Gupta dynasty period is regarded as the Golden Age of India. The city of Pataliputra is believed to have been built in 490 BC by Ajatshatru. However, it was originally a small fort known as Pataligram. The capital of the vast Gupta Empire was Pataliputra or the present day city of Patna, Bihar. The central location of the city of Pataliputra was ideal for the rulers to establish their administrative capital here. Pataliputra also acted as a base for the Gupta Empire to expand the territories of the empire around the capital. 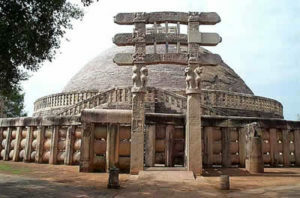 Pataliputra was one of the important educational centers during the Gupta dynasty period. Pataliputra remained a stronghold of the Gupta Empire until its decline. Pataliputra was also an important place as far as carrying out of trade and commerce activities of the Gupta Empire were concerned. During the reign of Chandragupta II (375- 415 CE), Ujjain became the second capital of the Gupta Empire.